One Month ONLY – Save 30% on CTC-1 Pro Console Shaper! 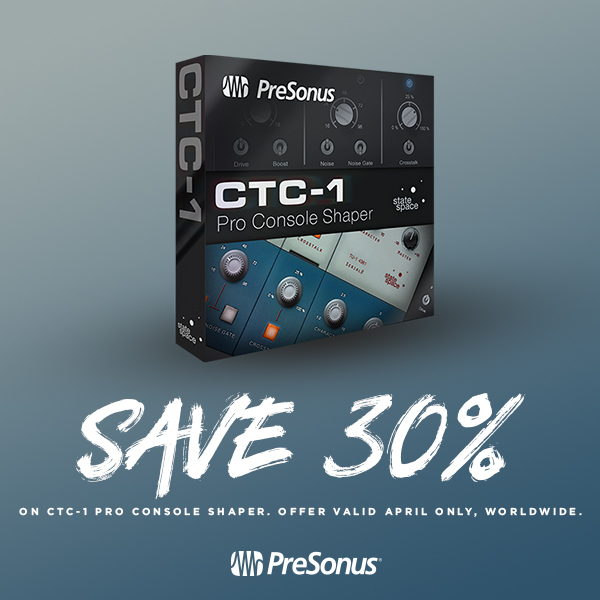 Starting today, Save 30% on the CTC-1 Pro Console Shaper right out of the PreSonus Shop! The CTC-1 Pro Console Shaper is the second in its series of Mix Engine FX plug-ins for Studio One. The add-on, which works with Studio One Professional 3.3.1 and later, provides three great-sounding models of classic British, vintage tube, and custom consoles and adds several major enhancements to the Mix Engine FX environment. Click here to purchase the CTC-1 Pro Console Shaper right out of the PreSonus Shop! Learn all about the CTC-1 Pro Console Shaper from our friend Marcus Huyskens! Posted in Promo / Discount | Comments Off on One Month ONLY – Save 30% on CTC-1 Pro Console Shaper!